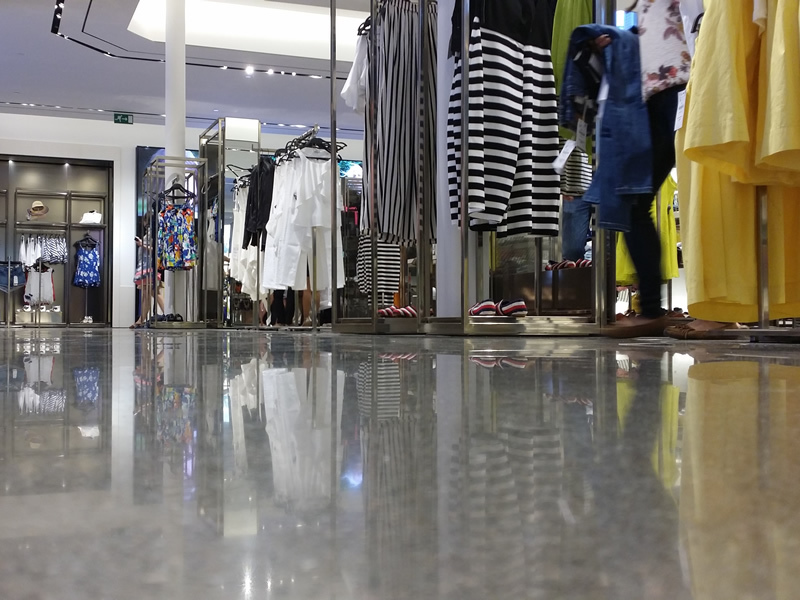 Zara's new flagship store in the heart of Madrid c/Serrano 23 is a perfect example of how to use a continuous terrazzo floor in modern architecture. – IN PRAISE OF SHADOWS – TANIZAKI. 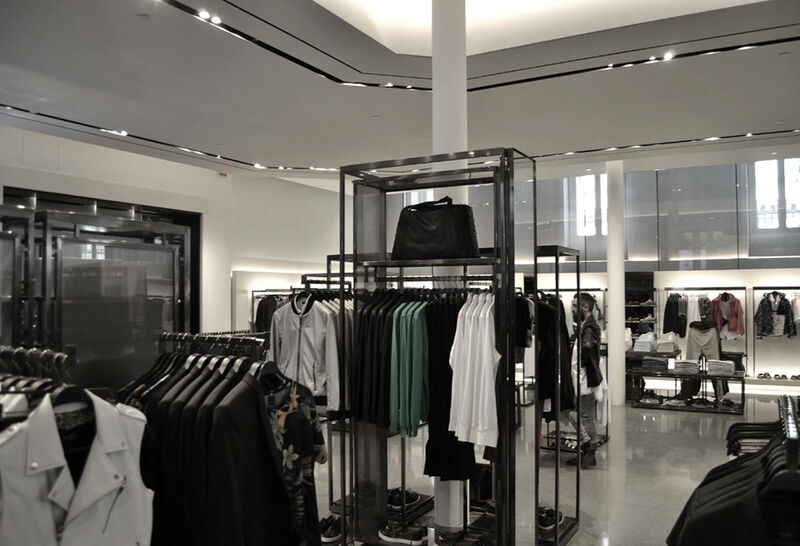 In this new store, Elsa Urquijo is totally faithful to her design concept and that is probably why, in spite of its size, it displays total balance and harmony. The interior of the building creates the illusion of being suspended in space. Between the internal glass structure and external brick facade there is a space of about 61 centimetres wide which allows the passage of light from outside. According to Elsa Urquijo the intention is to give the appearance of being inside a glass box, but without the feeling of being in an enclosed space. 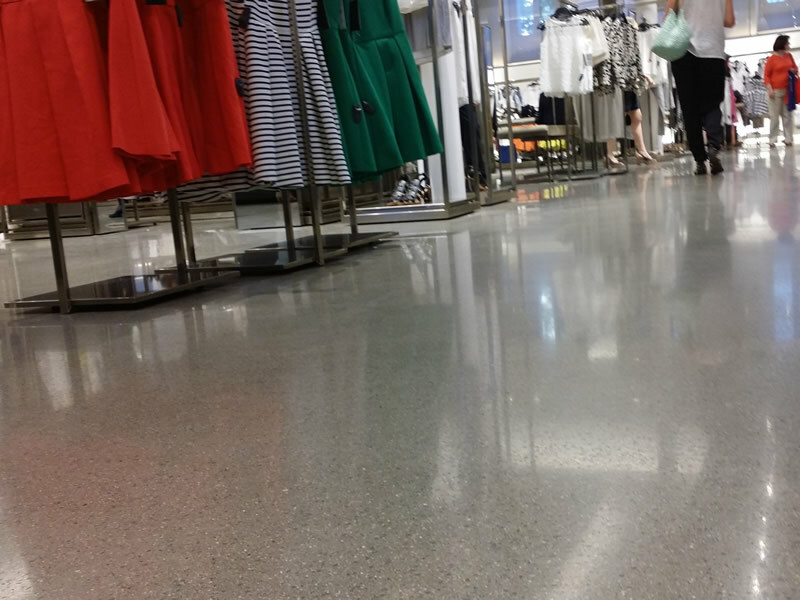 The floor is a continuous terrazzo mix. The combination of aggregates, a blend of recycled glass and natural stone, combined with the straight lines of decorative brass joints, makes an elegant and sophisticated surface. 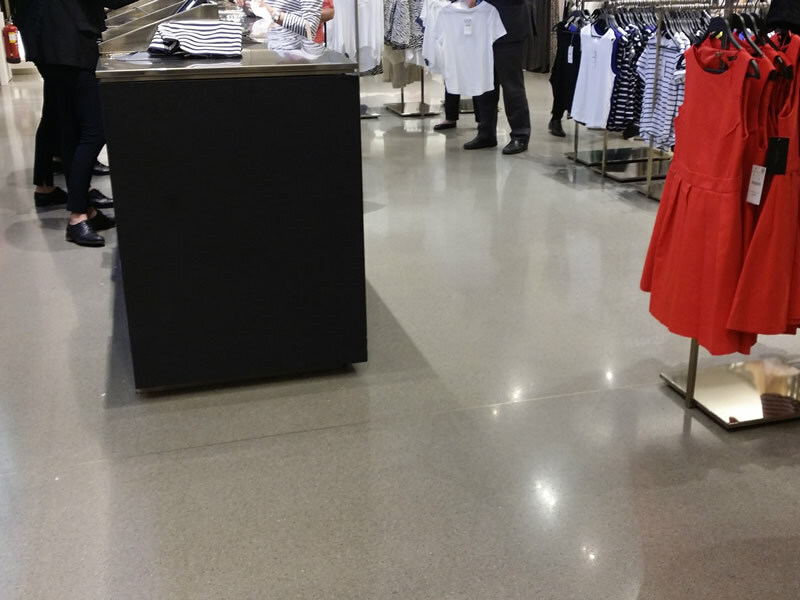 The perspective of the continuous floor has been used to create space and connect the small boutiques and areas. Being totally jointless, the floor with its neutral light grey color and light satin glow, together with the big white surfaces on the ceiling and wall panels helps to create harmony and provide balance and calm. elegance and subtlety that you only notice an almost imperceptible change of light and ambience. Even the floor plugs have been covered with a cap made with the flooring material, so they completely merge into the smooth surface. Light enters the building swiftly and naturally. To quote Tanizaki again; “The patterns of shadows, the light and the darkness, that one thing against another creates”. This is where an intriguing atmosphere is generated between the differently shaped shadows cast from the furniture, columns and windows. The clothing is displayed almost as in an art gallery and is of course, the focus of the store. This Zara creation in the heart of Madrid, shows us why Elsa Urquijo is the hottest Spanish name in shop design.